I had never heard of Lucio Silla by W.A. Mozart before going to see Opera Atelier’s 2016 production. The opera was written when the prodigy was only 16 years old. Mozart’s unparalleled genius, blended with the freshness of youth and idealism, made for a night of very charming, light, yet sumptuously intricate lyrical singing. Lucio Silla tells the story of a young senator, Cecillio, who has been exiled by the evil emperor Lucio Silla and torn away from his betrothed Giunia. Silla wants Giunia for himself and has spread a rumour that Cecillio is dead, but this ruse does nothing for his chances with Giunia. In his introduction, Marshal Pynkoski, Atelier’s co-artistic director, astutely observes that maintaining audience engagement in opera seria can be a real challenge. The conventions of the genre mean that the opera is predominantly comprised of lengthy, repetitive arias, interspersed with recitative, with few duets and ensembles. In this opera, the risk of monotony is compounded by the fact that many of the arias require intricate coloratura singing, which is difficult to execute, requiring that the singer be fairly static during those numbers. Applying their internationally renowned talent for period staging, Pynkoski and Zingg managed to cunningly circumvent these challenges. I barely noticed the passage of what could otherwise have been three very long hours. 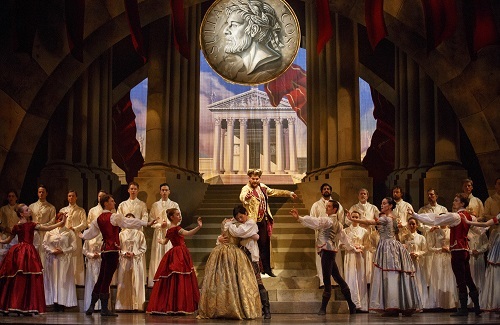 Their success lay in savvy casting choices, the stunning sets and costumes they are known for, and effective staging of other performers on the stage who were not busy with singing the incredibly challenging arias in this work. The sublimely sweet, fluid lyrical singing by baritone Kresimir Spicer in the title role was the first clue that perhaps this tyrant’s bark was worse than his bite. Spicer’s smooth execution of the sinuous, lyrical phrases for which Mozart is known flowed like warm maple syrup, coating the ear and making it impossible to believe that a man with so sensitive a voice truly possessed a heart of darkness. Singing so sweet and pure would have been wholly inappropriate in a true villain, but Spicer’s nuanced grasp of the role became clear when the ruler’s true nature was revealed. Peggy Kriha Dye has clearly immersed herself in the role of Cecillio, the exiled and lovelorn young senator. Her body language as a young man was thoroughly convincing, and her use of formal period gestures was infused with emotion. Kriha Dye is an Atelier regular and used the supple, crystalline clarity of her voice to elucidate the theme of choices between love, duty and idealism that are central to her character. Mireille Asselin’s frothy, carefree performance as Silla’s conniving sister, Celia, injected some much needed comic relief. Asselin’s light, sweet, and agile voice also possesses unmistakeable strength and power. This was just right for fun loving, self-interested Celia. Asselin is also a talented actress and demonstrated an exceptional grasp of comedic timing, drawing out the laughs with well- timed facial expressions and gestures. Her performance stood out for my companion, who was at the opera for the second time and is now inspired to know more. Mezzo-soprano Inga Kalna demonstrated jaw-dropping coloratura talent. I had not heard her sing with Atelier before and was thoroughly impressed by the rich, creamy texture of her voice. This, combined with prodigious agility, was truly awe inspiring. Meghan Lyndsay, in the role of Giunia, the tragic heroine, demonstrated herself to be a consummate performer in the role. She injected a dark, somber quality to her voice that I have not heard from her before. This did not appear to be in any way contrived, and rather seemed to be born out of a deep emotional connection to the heroine’s despair and rage. When everything worked out in the end, she reverted to her usual vibrant tone. The majestic sets truly captured the imposing power of the Roman Empire. The set for Giunia’s apartments within the royal palace was especially breathtaking. Designed on an angle with the horizon as the backdrop, the set featured very recognizable features of Roman architecture and created a wonderful illusion of infinite space in the background.The set designer also cleverly and cutely played with an unexpected ending by adding some cheerful touches to the backdrop during the curtain call (I won’t spoil it by saying any more). This production was less dance heavy than other Atelier productions I have seen. The ballet that was used was extremely memorable. Ballet dancers stormed the palace with swords and engaged in the most elegant, yet fierce-looking stage combat I have ever seen. Lucio Silla provides a wonderful opportunity see a Mozart rarity. A nice change of pace from seeing the handful of well-known works by this master that are usually mounted.